Alongside economic warnings and forecasts, a suggested increase in hate crime has been the social issue dominating headlines in the fallout from the vote to leave the EU in June. In the fortnight following the vote, the British Transport Police recorded 119 allegations of racist abuse and attacks on trains and at stations, which represented a 57% increase on the number of incidents recorded in the previous two weeks, and an 87% increase on the same period in 2015. Overall, according to figures released by the National Police Chiefs Council, more than 6,000 hate crimes were reported in England, Wales and Northern Ireland in the month from 16 June. This is equivalent to more than 200 per day, and 20% more than the same period last year. In response, the new Home Secretary Amber Rudd has announced a review by Her Majesty’s Inspectorate of Constabulary (HMIC) of how police forces in England and Wales respond to incidences of hate crime. The decision to ‘Brexit’ has undoubtedly highlighted divisions in the country that some fear may never be healed. While it obviously cannot be said that only those with the inclination to commit a hate crime voted to leave, there are those who argue that the result has only served to ‘legitimise’ the views of those that do hold xenophobic views. British politicians have been criticised by a UN committee on racial discrimination for their role in fuelling hate crime during and after the referendum campaign. The committee said that it was “deeply concerned” about the “divisive, anti-immigrant and xenophobic rhetoric” employed by some parties, with the media also coming in for criticism of its negative portrayal of minorities, immigrants, refugees and asylum seekers. While it’s easy to think of examples of this type of rhetoric from Leave campaigners (e.g. Nigel Farage’s ‘breaking point’ poster that was reported to police for inciting racial hatred), it’s important to consider that prominent Remain figures – including David Cameron, who once described migrants trying to reach Britain as a “swarm” – may also be partially to blame for the situation. The new government’s failure to guarantee the future of EU nationals currently resident in the UK is creating further unease. Of course, Brexit is not wholly responsible for the increase in hate crimes recorded. Nor are migrants the only group to be victims of crime, although racial hatred accounts for 82% of hate crime recorded by police. This is followed by religiously motivated crime, homophobic incidents, transgender hate crime, and disability hate crime. While misogyny is not currently included in the official definition of hate crime, Nottinghamshire Police recently announced that they would begin to record such acts, including wolf whistling, as hate crimes. The police say this is due to the “unacceptable” experiences of women on a daily basis, and has the aim of helping more victims to have the courage to report incidents. The force also recently treated an attack against a teenager who identifies as a goth as a hate crime, following Greater Manchester Police’s decision to treat these attacks as such in 2013. Underreporting of hate crime makes it extremely difficult to gain a picture of the true extent of the problem in the UK. The UK government’s recently published plan for tackling hate crime notes the discrepancy between the numbers of crimes reported to the police and those recorded by the independent Crime Survey for England and Wales (CSEW), which means that hate crimes are significantly underreported. The CSEW estimates that there were 222,000 hate crimes on average each year from 2012/13 to 2014/15, which represents a decrease of 56,000 since the previous period covered by the survey. At the same time, the number of hate crimes recorded by the police increased from 44,471 in 2013/14 to 52,528 in 2014/15, which the government attributes to better practice from the police and victims becoming more confident in coming forward. Nevertheless, the CSEW indicates that victims of hate crime are less satisfied by the response they receive from criminal justice agencies when compared with other forms of crime. Additionally, incidences of online hate crime are not covered by either sets of figures meaning that due to the dominance of social media, neither are likely to be truly indicative of what’s really going on. In recognition of the need to record online hate crime, the Metropolitan Police announced earlier this month that it has received funding from the Mayor of London and the Home Office to set up a specialist team dedicated to identifying online abuse and supporting victims. The two-year pilot has been set up following claims by community groups that the present police response to a problem they view as being of increasing concern has thus far has been inconsistent. 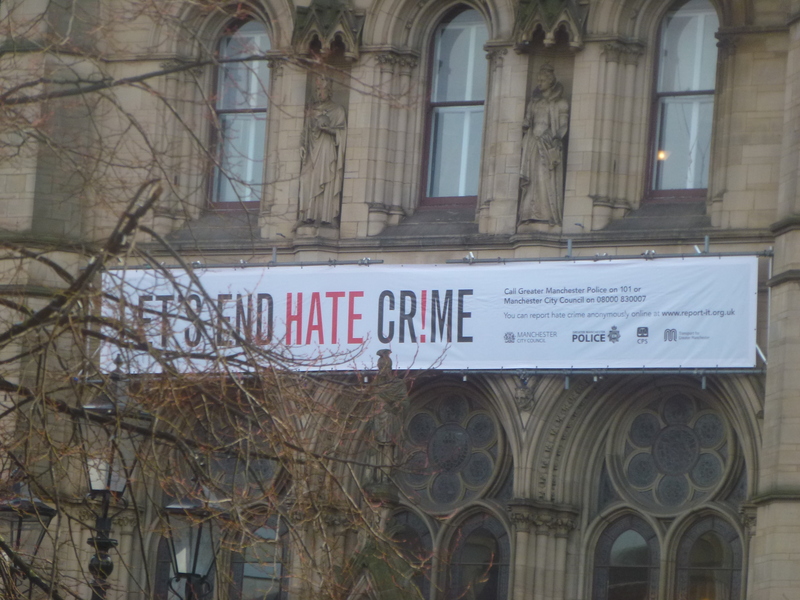 Encouraging responses to hate crime at the community level can in fact be seen across the country. Post Brexit, EU nationals have seen demonstrations of support in the form of safety pins and messages of solidarity both on and offline. It can only be hoped that those criticised for exacerbating tensions within and between communities will start to follow these examples as we continue on in deeply uncertain times. If you enjoyed reading this post, you might like our previous post on the impact of Brexit on the Digital Economy Bill.